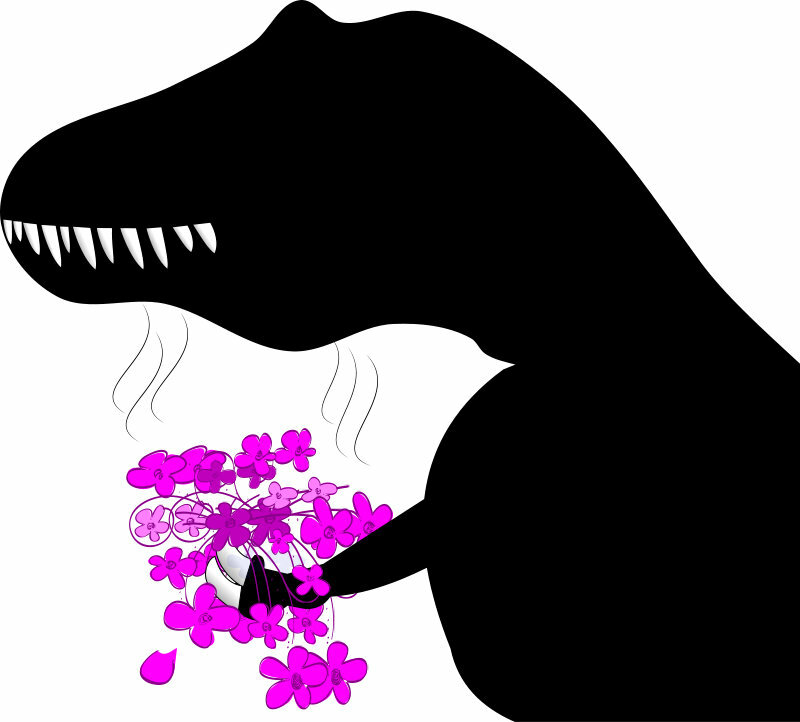 Dinosaurs dug flowers. Probably by the ton. How do we know this? We don’t. But recent revelations that flowering plants existed a hundred million years before previously thought, demands contemplation. Dinosaurs were clever, adaptive, cunning and resourceful. Anything that survives and thrives for hundreds of millions of years has to be. Because of the sheer size of many of the creatures, and the prominent teeth and jaws of some species, it’s assumed that their lives were nasty, brutish, and short. While fossil evidence shows tooth and claw marks on the bones of some, for the vast numbers and span of their reign, the skeletal remains should be positively riddled with bite marks and evidence of brutal ends to short, terror-filled lives. Most depictions show dinosaurs either running in terror from grim death at their heels, or inflicting it. Consider the hundreds of millions of years they reigned. Only now are we understanding that many species were fledged, and likely colorful; some species we now believe sported fleshy combs on their heads, like roosters, likely to attract mates. From bony chambers on other breeds’ skulls, it’s certain some were capable of projecting a range of sounds to great distance, just as others were equipped to receive these signals. With each passing year, our knowledge of dinosaur socialization grows. We’ve recently learned that flowering plants were on the scene at least 100 million years sooner than previously thought. Could it be that the creatures that roamed the planet liked a nice bouquet or a romp in a florid meadow now and then? In that dense, tumultuous, oxygen-rich fetid atmosphere, flowering plants might have been a welcome relief. And imagine the power of some of the scents they relied on then; any flowering plant must have been impossibly fragrant to succeed among the rampant olfactory competition. There was the Trippalotosaur, an ambush predator that worked in pairs. This little-known raptor species would string together garlands of flowers on thick vines, lay these across trails, then pull them up at the last moment, tripping hapless quarry. 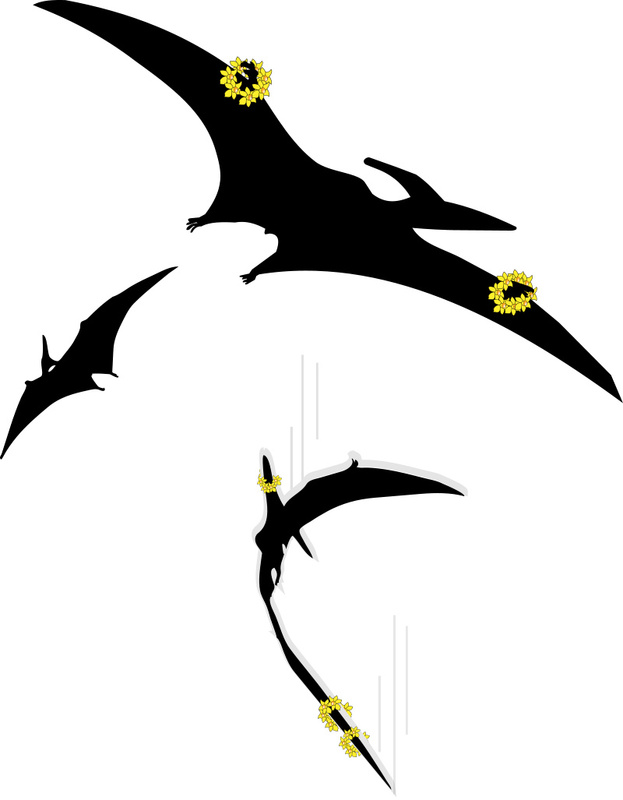 The Pteradaffodil would frequently soar with nooses of flowers around their bills. In a version of aerial ring-toss, they’d drop them from great height onto members of their own species. This would often ensnare the bills of their prey, which would starve the victim and weaken it for easy pickings. Alternately, rings caught on the wings of prey would destabilize the victim’s flight, causing them to crash. A Sanguinsidiaurus (‘Blood Ambusher’) was a species of dino that decorated itself with the ancestral form of the Blood Lily, the firey red blossoms to suggest wounds, then lay on the ground in wait for unsuspecting prey. As an additional kick, the prehistoric lily was even more poisonous than the present-day variety. Not all uses of things flowering were predatory. The Sarcosuchus, the 10-ton crocodile from the Cretaceous period, loved to have its belly tickled. Long before the modern spectacle of crocs ambushing thirsty Wildebeests alongside meager African watering holes, these giant crocs would sprinkle an ancient variety of lotus upstream. 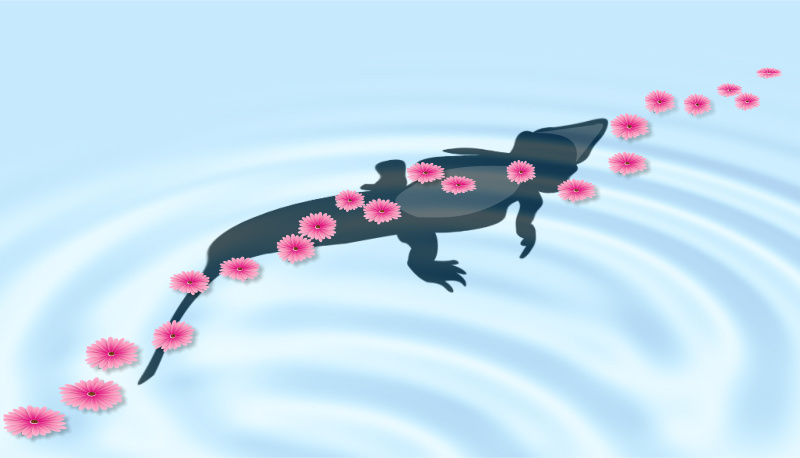 The sight of the meandering blossoms on the current would attract herds of Massospondylus, small, plant-eating dinosaurs. Underwater, the crocs lay upside down, and delighted in the dance of the herds’ hind claws across their bellies. Some theories have that the action helped clean the croc’s skin of parasites. Those tiny little forearms on Tyrannosaurus Rex could not have served any purpose at all. The debate has raged for years that they might have been used to hold onto mates during coupling, or to help lever the beast up from the ground in a fall, or to hold small prey. All conjecture, which makes our guess as good as anyone’s. Consider the fetid cavern of rotting gore that was the mouth of T. Rex was for days after a meal, whether the critter was a scavenger, heads-up hunter, or both. Those little arms were too far away to hold the toothbrush the Tyrannosaur sorely needed, but were just the right location to hold a bunch of posies to ward off the stench. Petrified pollen grains found on the fossilized teeth of one fearsome predator led to the assignation of the name Crepodraconis (‘Snap Dragon’). 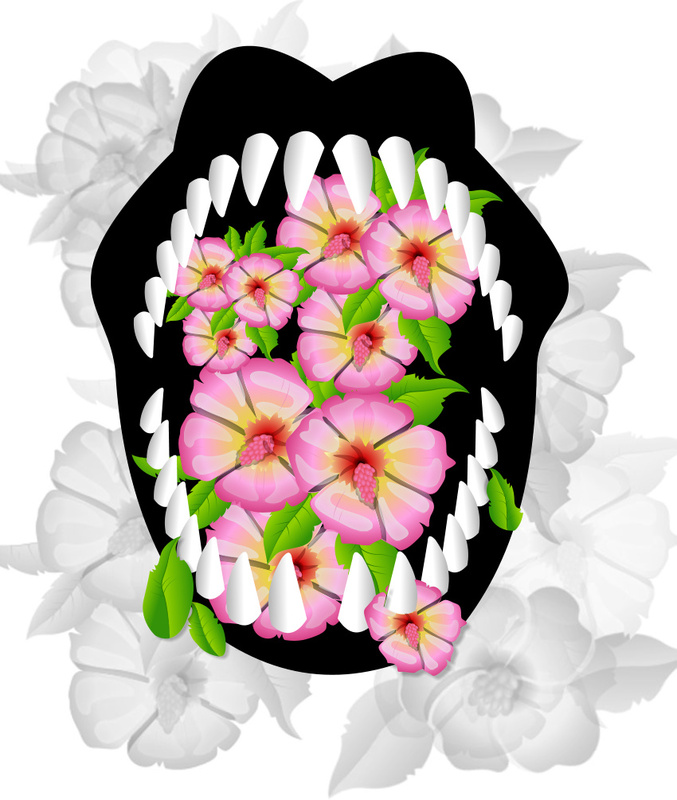 This beast was theorized to have lain in wait for hours, its head concealed by surrounding foliage, its massive jaws open and disguised by heaps of a primitive yet stunning figwort blossoms. Of course, only good things come to those who wait.